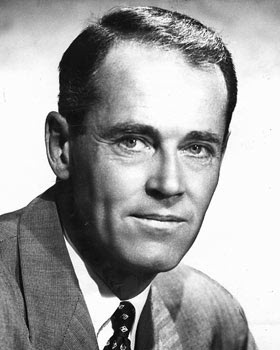 Henry Jaynes Fonda (May 16, 1905 – August 12, 1982) was an American film and stage actor. Fonda made his mark early as a Broadway actor. He also appeared in 1938 in plays performed in White Plains, New York, with Joan Tompkins. He made his Hollywood debut in 1935, and his career gained momentum after his Academy Award-nominated performance as Tom Joad in The Grapes of Wrath, a 1940 adaptation of John Steinbeck's novel about an Oklahoma family who moved west during the Dust Bowl. Throughout six decades in Hollywood, Fonda cultivated a strong, appealing screen image in such classics as The Ox-Bow Incident, Mister Roberts and 12 Angry Men. Later, Fonda moved both toward darker epics as Sergio Leone's Once Upon a Time in the West and lighter roles in family comedies like Yours, Mine and Ours with Lucille Ball. Fonda was the patriarch of a family of famous actors, including daughter Jane Fonda, son Peter Fonda, granddaughter Bridget Fonda, and grandson Troy Garity. His family and close friends called him "Hank". In 1999, he was named the sixth-Greatest Male Star of All Time by the American Film Institute. 218 – Julia Maesa, aunt of the assassinated Caracalla, is banished to her home in Syria by the self-proclaimed emperor Macrinus and declares her 14-year old grandson Elagabalus, emperor of Rome. 1770 – 14-year old Marie Antoinette marries 15-year-old Louis-Auguste who later becomes king of France. 1812 – Russian Field Marshal Mikhail Kutuzov signs the Treaty of Bucharest, ending the Russo-Turkish War, 1806-1812. Bessarabia is illegitimately annexed by Imperial Russia. 1868 – President Andrew Johnson is acquitted in his impeachment trial by one vote in the United States Senate. 1877 – 16 May 1877 political crisis in France. 1891 – The International Electro-Technical Exhibition opens in Frankfurt, Germany, and will feature the world's first long distance transmission of high-power, three-phase electrical current (the most common form today). 1914 – The first ever Lamar Hunt U.S. Open Cup final is played. Brooklyn Field Club defeats Brooklyn Celtic 2-1. 1919 – A naval Curtiss aircraft NC-4 commanded by Albert Cushing Read leaves Trepassey, Newfoundland, for Lisbon via the Azores on the first transatlantic flight. 1929 – In Hollywood, California, the first Academy Awards are handed out. 1943 – Holocaust: The Warsaw Ghetto Uprising ends. 1948 – Chaim Weizmann is elected the first President of Israel. 1953 – American journalist William N. Oatis is released after serving 22 months of a ten-year prison sentence for espionage in Czechslovakia. 1960 – Theodore Maiman operates the first optical laser, at Hughes Research Laboratories in Malibu, California. 1969 – Venera program: Venera 5, a Soviet spaceprobe, lands on Venus. 1974 – Josip Broz Tito is re-elected president of the Socialist Federal Republic of Yugoslavia. This time he is elected for life. 1975 – India annexes Sikkim after the mountain state holds a referendum in which the popular vote is in favor of merging with India. 1983 – Sudan People's Liberation Army/Movement rebels against the Sudanese government. 1986 – The Seville Statement on Violence is adopted by an international meeting of scientists, convened by the Spanish National Commission for UNESCO, in Seville, Spain. 1988 – A report by United States' Surgeon General C. Everett Koop states that the addictive properties of nicotine are similar to those of heroin and cocaine. 2003 – In Casablanca, Morocco, 33 civilians are killed and more than 100 people are injured in the Casablanca terrorist attacks. 2005 – Kuwait permits women's suffrage in a 35-23 National Assembly vote. 2007 – Nicolas Sarkozy takes office as President of France.